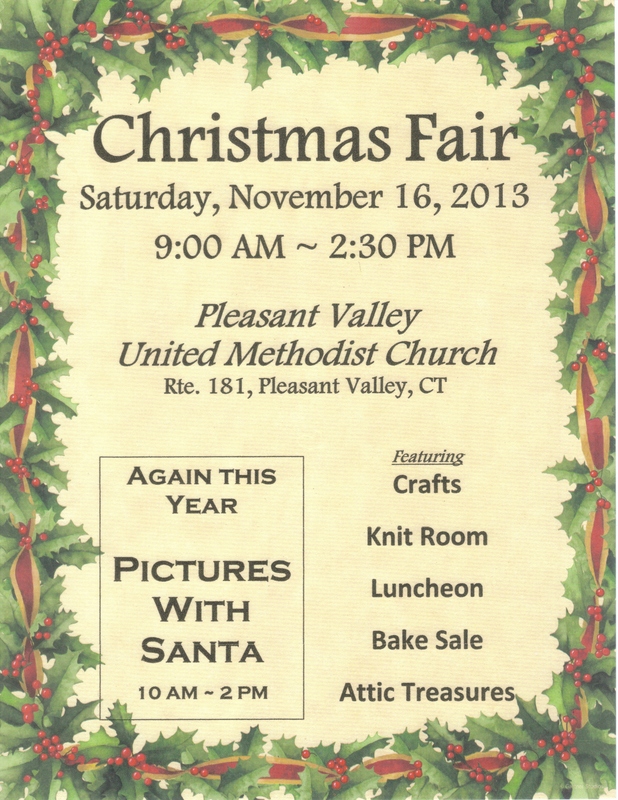 Christmas Fair: Saturday, November 16th! The annual Christmas Fair, hosted by the United Methodist Women, will take place this year on Saturday, November 16th from 9:00 AM to 2:30 PM. There are lots of things to see to help you get your holiday shopping started. We’ll offer a Bake Sale table filled with goodies to entice you; a Knit/Crochet Room that offers handmade items to keep you and your loved ones warm this winter; lots and lots of handcrafted items from the practical to the unique to items just for fun; Attic Treasurers will offer items that are treasures to be found, and our Christmas Cafe will be open to serve you and your friends a hearty, homemade lunch. Santa will be available from 10 AM to 2 PM and he’d love to have his photo taken with your children. As you’re making your rounds of the holiday fairs this time of year, why not plan to stop in and visit with us…and take time to enjoy a warm lunch! We look forward to seeing you.